Waterford Country School’s Residential Treatment Program provides a spectrum of therapeutic services to children and youth throughout the State of Connecticut who cannot remain in their communities because of family issues, trauma, abuse, or serious behavioral problems. Set in a peaceful country environment on the Waterford Country School campus, the Residential Treatment Program consists of three comfortable cottages with a total of 18 beds in both private and semi-private rooms. The children are supervised around the clock by compassionate child care workers specially trained to address the unique needs of at-risk children and adolescents. The Residential Treatment Program provides services to boys and girls aged 12 to 18. The length of a young person’s stay depends on the individual but is typically six to nine months. 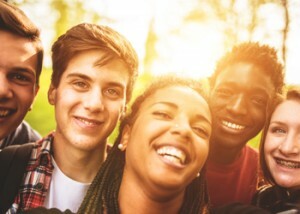 Adolescents are generally referred for Waterford Country School’s residential treatment program by Connecticut’s Department of Children and Families or through private health insurance referral sources. Ask us about private insurance; we would be happy to determine if WCS is the right fit for your child and we will research any family insurance policy. The goal of Waterford Country School’s Residential Treatment Program is to focus on developing the social, emotional, and behavioral skills of the residents to enable them to successfully return to their homes, schools, and/or communities. Services include individual, group and family therapy that is strength-based and trauma informed, numerous recreational activities, participation in league sports, and specialized education in a structured classroom setting. There are many experiential opportunities, both in the classroom and on the farm. Residents are also participants in the Challenge Ropes Course, where teamwork, trust, and personal challenges abound. There are also many opportunities for community integration through local events, employment and volunteer services.